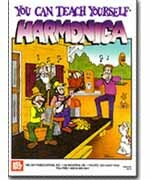 A wonderful, easy-to-understand beginning harmonica book for both folk and blues harmonica stylings. Several different styles are analyzed and representive tunes are given in each style. With the various sections the songs are roughly graded as to difficulty. An extra section examines some specialized techniques and introduces some harmonicas other then the standered ten-hole-twenty-reed diatonic harp (in the key of C) for which most of the songs in this book are written. All together, 41 harmonica arrangements are included.